Meg Danforth Lineberger | Ph.D.
Meg Danforth, Ph.D., CBSM, is a licensed psychologist and certified behavioral sleep medicine specialist who provides advanced clinical care to patients with sleep disorders and comorbid medical and mental health issues. She is a clinician and educator at Duke University Medical Center in Durham, NC. As the Director of the Duke Behavioral Sleep Medicine Clinic, she has been helping people sleep better without medication for the past 15 years. She also provides clinical training and supervision to psychology graduate students, interns, and fellows. 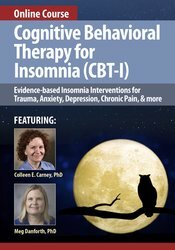 Dr. Danforth is committed to teaching clinicians from a variety of backgrounds to deliver CBT-I in the settings in which they practice. Her work has been featured in the Associated Press and CBS News. Financial: Margaret Marion Danforth is a clinical associate at Duke University Medical Center. She receives a speaking honorarium from PESI, Inc. Non-financial: Margaret Marion Danforth is a member of the Association for Behavioral and Cognitive Therapies.